Cardiff lost 4-0 to Sunderland today, missing out on what was likely their final opportunity to save their season. Having struggled all year, they now sit at bottom of the Premier League, seemingly destined to return whence they came. They battled for years to exit the Championship, seemingly permanently destined to miss out at the final hurdle. Along came Vincent Tan and his millions, and in exchange all Cardiff had to sacrifice was their soul. The change from blue to red came with protests from a select few, and a certain level of acceptance from the rest. Admittedly, it is rare that you see a Cardiff fan in the red kit in the stands, but to sit in the stands you’re essentially saying that you accept the situation. You’re paying up. I had a discussion with friends after the final whistle went in that match, centring around our level of sympathy towards those Cardiff fans who’ve continued to show up as the club has slipped further and further into being Tan’s plaything. As it turned out, none of us felt much. On the other hand, I have great respect for those who’ve managed to disentangle themselves from their own inherent fandom and understand that what has occurred at Cardiff is not right. One of those odd quirks of football is that it involves a constant casting of other people as villains and your own side as the heroes. You then have dislikes that are inherent to you, built up over the course of a supporting lifetime. The reality is that most fans will dislike very few teams properly. You might have a 1-0 loss on a cold Tuesday night to search for some spite in, but when the camera pans to the faces of the fans after a relegation, it’s often difficult to find much joy in it. Cardiff, or, to specify, this Cardiff, will not receive much sympathy from me when their relegation is confirmed. The simple act of changing the shirt colour turned them from Cardiff to Vincent Tan United. In supporting the club through this campaign, fans have essentially accepted the fate. It’s not as though they were already committed to season tickets as they were last year – they’ve exchanged their love and what they originally fell in love with, for the empty promises of a single season in the Premier League. I suppose it is difficult for me to talk, as a fan of Leeds United, who famously changed their kits to all-white in the 60s. The difference, I suppose, was the reason behind the change. Ours was to emulate the great Real Madrid and fans agreed with it because it symbolised a footballing ambition. We had also only existed for 42 years and had changed kit colours twice in that period already. Cardiff changed theirs because red is more marketable in Malaysia. Do not consider this to be an attempt at having a go at those fans who went this season, but look at the fate Tan and his egotistical actions have sent you inevitably drawn towards. You’re back at square one in exchange for quite a public embarrassment of your club. Have more respect for it. 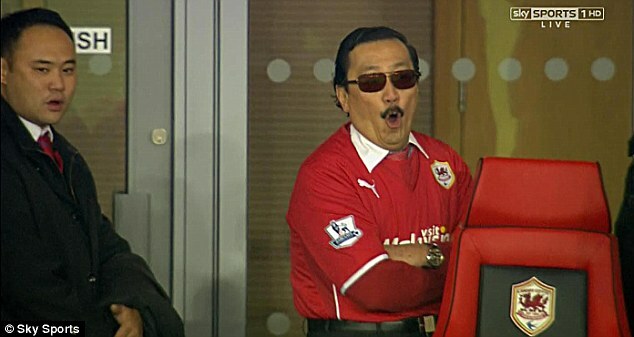 There are thousands of Cardiff fans wearing red at their home games and Vincent tan has been praised by thousands for what he has done…….until the results stooped going their way. After that Vincent tan has been blamed for the downfall of the club. Fans are fickle and none more so than at Cardiff. A club where fans think they are owed success because they are a capital city but in fact they have not acted properly in football terms for the last decade and most neutrals will feel they are reaping what they have sowed.